I'm having fun with all my balls hanks n skeins. I'm a downright crocheting fiend. 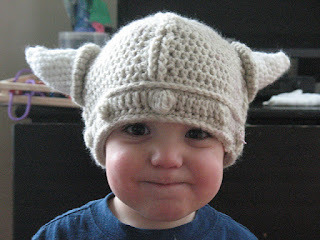 Today I finished my boy's viking hat. A design by mamachee. I started a toddler dress for little laney of my own design (we'll see what happens!). Tonight I'm going to start "strawberry beret" for my girl. A design by Amanda.